According to Forrester, 80% of the buying process is expected to occur without any human-to-human interaction. Customers today want to know they are making the best purchase and will take the time to research all of their options before making a commitment. While this means you’ll face more competition, it also provides you with more opportunities to reach potential customers (your ideal buyer persona) at each stage of their decision-making process. Understanding the buyer’s journey will give you insight into: your prospects’ psychology, how to meet their needs, and as a result how to convert them to sales. 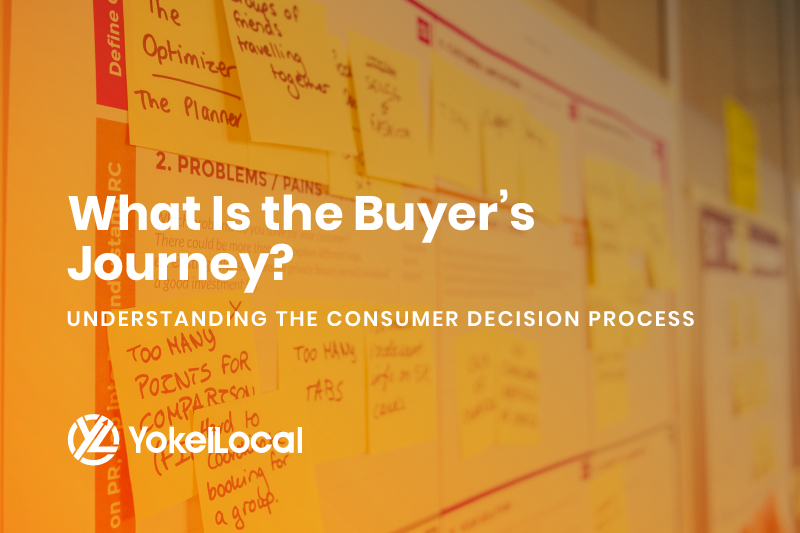 The buyer’s journey can be summarized simply as "the customer's path to purchase" during which they research a problem, find potential solutions to it, and then choose one of those solutions. Customers today have more access to information than ever before to compare your business, and the services or products you offer, to your competitors. However, this also means that you have the opportunity to earn their trust very early in their journey, before they are even looking at your competitors (or reach the "Provider Aware" stage of their journey). Why Is It Important to Understand Your Customers' Buyer's Journey? The buyer’s journey provides you with a way to understand the kinds of questions your customers will ask when looking for a solution to the problem you hope to address. Buyers that are only learning about their pain points or who are exploring potential solutions will want much different information that someone who is ready to make a purchase. If you know what your personas are looking for at each stage of the buyer’s journey, you can create content that is better tailored to their needs. Instead of going out to find them, they’ll find you naturally during their search for information. Many companies focus their marketing efforts at the bottom of the sales funnel and try to reach customers when they are ready to make a purchase decision. However, there are many opportunities to win a customer’s trust and business higher up in the funnel. After all 96% of website visitors aren't even in the decision stage. If you can earn a prospect’s trust early on, you can later present yourself as the solution to their problem when they are ready to make a purchase decision. 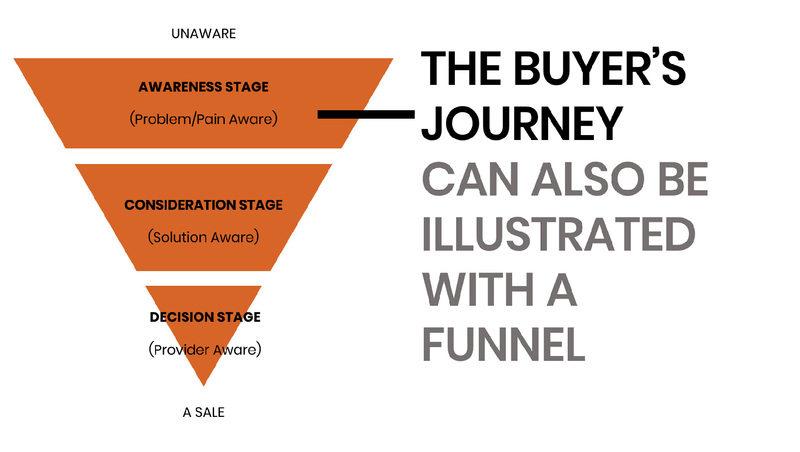 By asking the right questions during each stage of the buyer’s journey, you can raise the quality of your leads and get a better return on your marketing efforts. What Are the Three Stages of the Customer Decision Process (Buyer's Journey)? During each stage, the customer will want answers to a different set of questions as they get closer to making a purchase decision. It’s important that you create content offers that are appropriate for each stage of the buyer’s journey, as you could cause the buyer to turn elsewhere if they feel pressured by the wrong content offer or if the information is irrelevant. However, if you correctly match your content with their expectations, you could win their business and ultimately increase the lifetime value of each customer as they come back for repeat purchases or refer you to others. 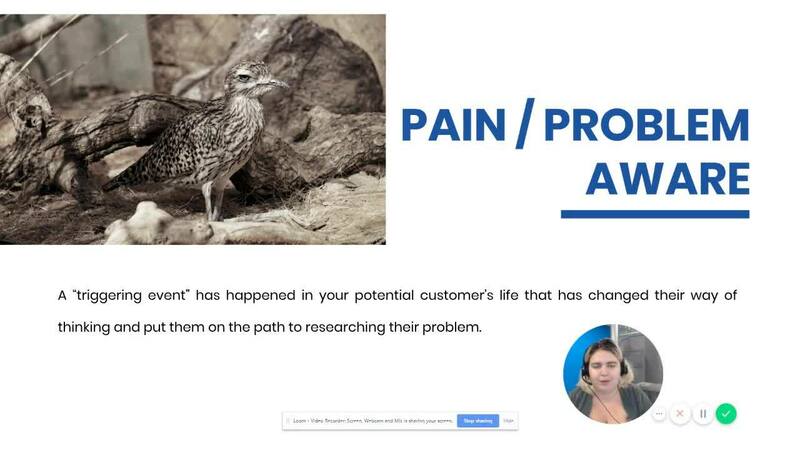 In the Awareness Stage, a buyer will have a pain point they will research, but they won’t necessarily be looking for potential solutions just yet. They may only be aware they have a problem, but they not know what kinds of questions to ask about it, much less the full scope. At this stage they’ll be looking for general information about the problem instead of solutions. During the Consideration Stage, the buyer will build on their previous research and begin looking at potential solutions to their problem. By this time, the buyer knows they have a problem and will be ready to read about products or services different companies offer to address it. However, they’re not quite ready to be sold on a particular one and are trying to learn about the advantages and disadvantages of each. The buyer may search for the term “Pest Control Company in Las Vegas,” which will give them a list of companies they can explore further. Once the buyer reaches the Decision Stage, they’ve explored all available options to address their problem and are interested in purchasing a particular product or service. They will begin researching it, and the company, by checking reviews, reading testimonials, watching videos, and more. Buyers today want to be informed before they make a commitment, which gives you the opportunity to show them why you deserve their business. At this point, the buyer may have the question “Do You Have a Satisfaction Guarantee?”, and you’ll be able to show them glowing reviews from past clients and examples of the work you offer. 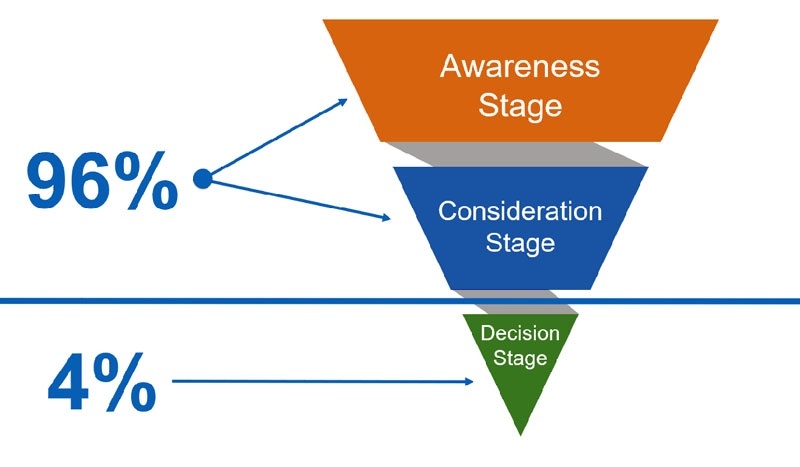 If the persona is in the awareness stage, they may be searching for top-of-the-funnel keywords. The strategy would be to create content that addresses those questions and keywords on the blog and FAQ pages. If the persona is in the consideration stage, they may be searching for middle-of-the-funnel keywords. The strategy would be to create content that addresses those questions and keywords on the service pages, blog, and FAQ pages as appropriate. If the persona is in the decision stage, they may want to know more about the company, they may need answers to certain questions, or they could have sales objections preventing them from making a decision. The strategy would be to address those questions and concerns on service pages, on sales pages, and during sales calls as appropriate. 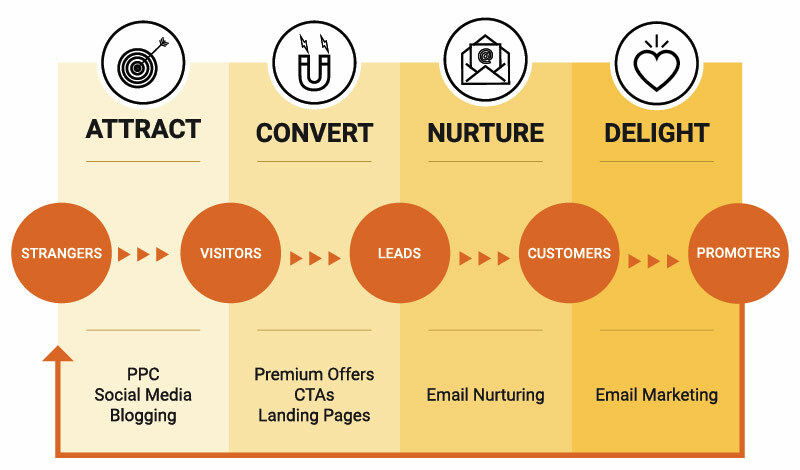 If you attract a prospect during any one of those stages and they convert without becoming a customer, you can utilize lead nurturing through email marketing automation to guide them farther down the buyer's journey. Before you start using the buyer’s journey in your marketing plan, you’ll need to know more about your target audience. 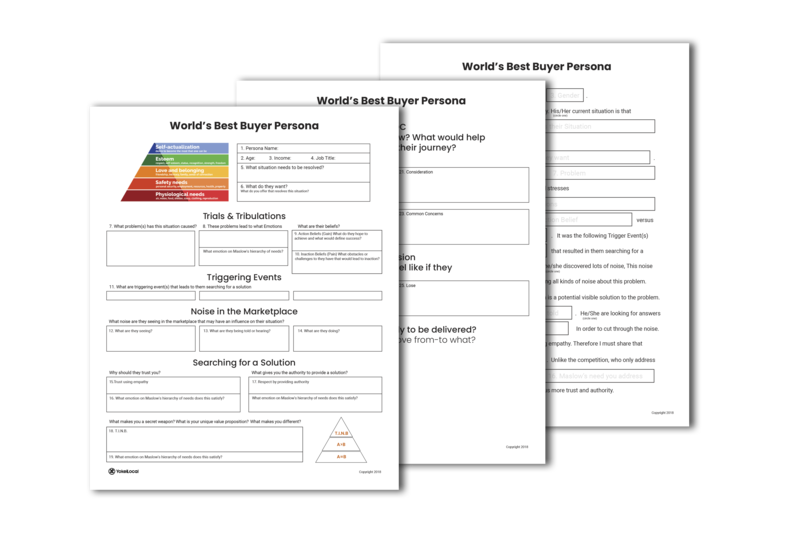 You can start by downloading our free buyer persona worksheet, which can help you identify the pain points and characteristics of each buyer persona that uses your business. You can then create content perfectly suited to their needs and steadily move them along the buyer’s journey. Once you learn more about your customers, you can make your marketing efforts count and position yourself as their trusted authority. Read your customers' minds by creating your buyer persona. We don't call it The World's Best Buyer Persona for nothing.